Maria Teresa Merlo, the daughter of Ettore Merlo and Vincenza Rolando, is born in Castagnito (Cuneo), Italy. She was the second of four children. She is baptized in Castagnito’s parish church, St. John the Baptist, by the pastor, Fr. Pietro Palladino. Godparents: Leone Merlo and Margherita Rava Rolando. Completes grades 1-3 in Castagnito’s elementary school. Since the village school does not offer any higher education, her parents arrange for her to continue her studies privately under teacher Maria Chiarla. Makes her first communion in Castagnito’s parish church. Is confirmed in Castagnito’s parish church by Bishop Giuseppe Francesco Re (1848-1933), Bishop of the Alba Diocese. Godmother: Mrs. Carolina Zocca Barbero. Attends sewing and embroidery classes in an institute in Alba known as “Ritiro della Providenza,” run by the Sisters of St. Anne. Afterward, is sent by her parents to Turin to complete her training as a seamstress. Writes to her parents from Susa. There is no information as to whether or not she had ever been there before. Opens a small sewing and embroidery school for girls in her parents’ home in Castagnito. Not only teaches her students how to sew but also helps them develop their prayer life. Fr. Alberione opens a “Workshop for Young Women” in Piazza Cherasca, no. 2, Alba–a building vacated by the boys of his “Typographical School”, who had transferred their headquarters to Moncarretto on 5 May. 15 June marks the birth of the Daughters of St. Paul. The first person to collaborate with the Founder in this initiative is Miss Angela Boffi. Teresa moves into Angela Boffi’s home in Alba in order to collaborate with her in Fr. Alberione’s project. 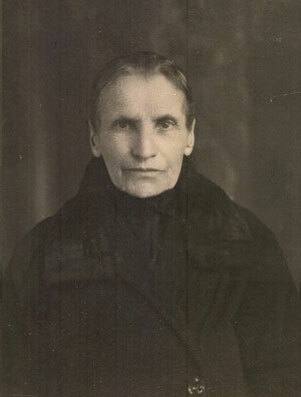 In 1923, M. Thecla would write of her first companion: “That day we had a long talk together; we understood each other, came to an agreement and began to love each other as true sisters.” In the division of duties, Teresa takes over the management of the “Workshop for Young Women” and the small book and religious articles shop that was opened towards the end of the year. The young women’s workshop and living quarters are transferred to a new location: Via Accademia, 5. Entrance of Clelia Calliano, the third member of the community. In Alba, Teresa and her companions frequent the Catechetical League attached to Sts. Cosmas and Damian Church. There they attend the religious education courses organized by Canon Francesco Chiesa (1874-1946) and also teach catechism in the parish. They participate in the annual spiritual exercises and in the monthly retreats organized for the group. Starting in 1916, these courses of spiritual exercises are preached by Fr. James Alberione. Teresa makes her private temporary vows in the hands of Fr. Alberione. Teresa takes the written examination for catechism teachers. Works as a catechism teacher in Sts. 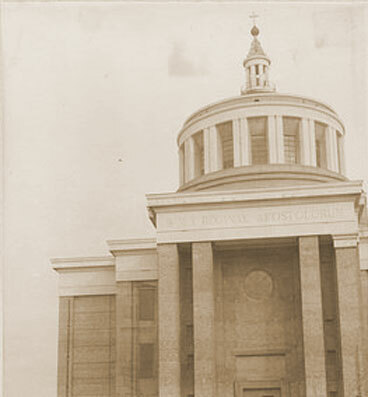 Cosmas and Damian parish–a service she carried out until the end of 1918, when she left for Susa. 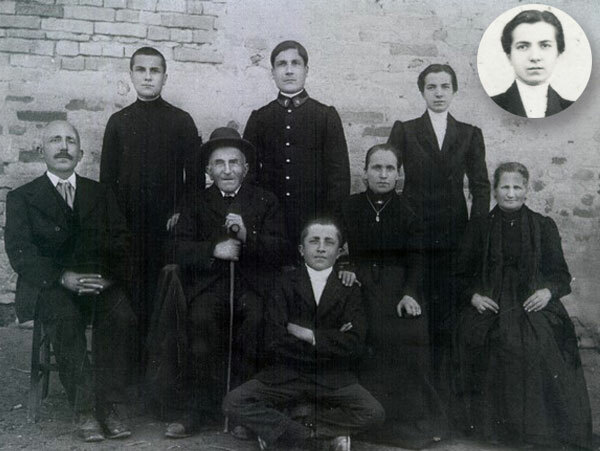 13-year-old Emilia Bianco (later known as Maestra Clelia) enters as the Congregation’s first “aspirant”. Clelia Calliano dies, offering her life for the Good Press and for the future Congregation of the Daughters of St. Paul. Teresa takes the oral examinations for catechists. 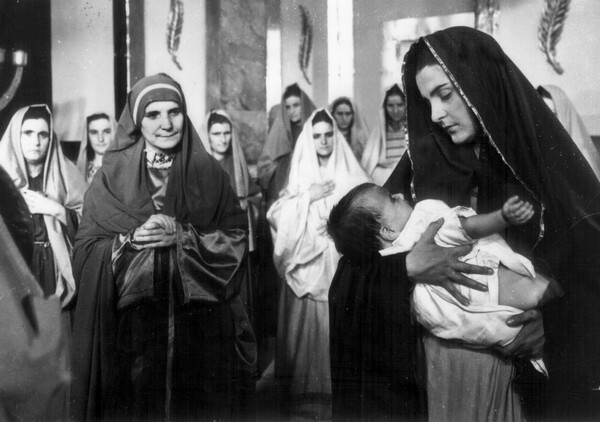 Together with eight other women, Teresa makes her private religious profession and takes the name of Maestra Thecla. With this act, the Pious Society of the Daughters of St. Paul is initiated. On this occasion, Fr. Alberione appoints Teresa Superior General of the Daughters of St. Paul for a period of 12 years. Angela Boffi leaves the community of the Daughters of St. Paul. Maestra Thecla hands over the “St. Paul Book Shop” in Susa to Mr. Enrico Piazza. The small Susa community returns definitively to Alba and joins forces with the community of Daughters of St. Paul that had been established in Alba during their absence. M. Thecla writes down some of her remembrances about the beginnings of the Daughters of St. Paul. On the basis of these notes, a series of articles are written and printed in the Pauline Cooperators’ Bulletin (UCBS) between June 1923 and April 1925. Fr. Alberione initiates the Pious Disciples of the Divine Master. Following the Decree of Diocesan Approval (1929), M. Thecla becomes Superior General of this group too until 25 March 1947. M. Thecla sends a group of young sisters, under the guidance of Maestra Amalia Peyrolo, to open a community in Rome. Two days earlier, on 14 January, two other Daughters of St. Paul, as well as a group of boys of the Society of St. Paul led by Fr. Timothy Giaccardo, had already left for the same destination. M. Thecla visits (perhaps for the first time) the FSP community of Rome. Together with other sisters, M. Thecla puts on for the first time the religious garments that will become the habit of the Daughters of St. Paul. The Congregation’s first branch house is opened in Salerno to carry out the apostolate of diffusion. In the same month, the FSP communities of Bari and Verona are also opened. M. Thecla personally accompanies the founding sisters and helps them get started. These are her first apostolic trips. Goes to Cagliari to help the sisters open a community there. Bishop Giuseppe Francesco Re approves the Pious Society of the Daughters of St. Paul as a Congregation of Diocesan Right. In the decree, M. Thecla is recognized as the Institute’s Superior General, with the title of Prima Maestra. Together with her four councilors, M. Thecla makes her public perpetual religious profession in the hands of the Founder, the delegate of Bishop Giuseppe Francesco Re. She thus becomes qualified to receive the vows of the sisters. M. Thecla sends her first circular letter to the communities of the Daughters of St. Paul. Goes to Messina to help the sisters open a community there. First FSP foundation outside Italy made in Sao Paulo, Brazil. In Alba, the Daughters of St. Paul published the first issue of the magazine Famiglia Cristiana under the direction of Sr. Rosa Capra, FSP. Fr. Alberione divides material goods (property) and areas of apostolate between the Society of St. Paul and the Daughters of St. Paul. M. Thecla draws up her will, leaving everything she possesses to the Pious Society of the Daughters of St. Paul. In Alba, the Daughters of St. Paul move from their house next door to the Society of St. Paul to their new residence in Borgo Piave, which will become their Motherhouse. Publication of the Congregation’s internal news bulletin, Eco di Casa Madre (Echoes from the Motherhouse), is begun. 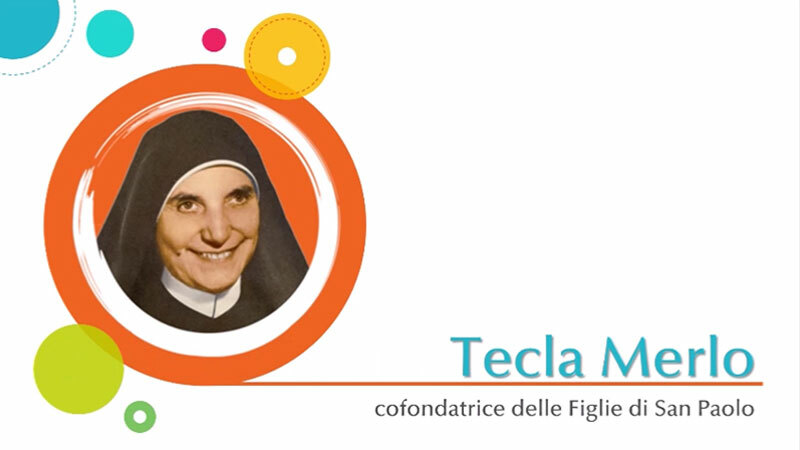 The Bulletin will make available to the sisters in the local communities the writings of the Founder, of M. Thecla, and news about the Congregation. In a circular letter, M. Thecla urges the Daughters of St. Paul to work for the spread of the League for the Daily Reading of the Gospel. In keeping with the Founder's advice, M. Thecla introduces the rule of mandatory periodical correspondence between the sisters and the Superior General. According to this rule, all the sisters are to write to the Superior General for Christmas and for the Feast of St. Paul. M. Thecla leaves from Genoa on the ship “Augustus” for her first trip abroad: a visit to the FSP communities of Brazil and Argentina. Returns by ship to Genoa on 27 August 1936. M. Thecla moves the FSP Generalate to Rome and with her. Leaves on the steamship “Rex” for a visit to the FSP community of New York, USA. 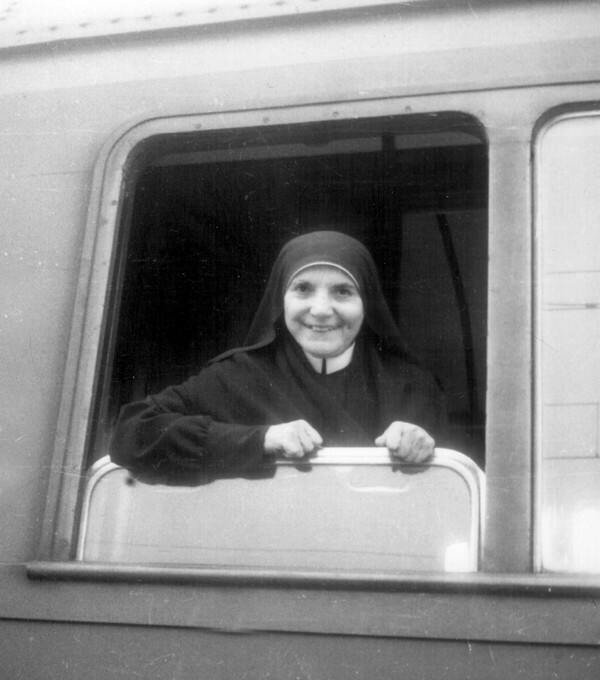 Returns to Rome on 6 March 1937. Transfers the novitiate and the group of FSPs studying philosophy and theology from Alba to Rome. 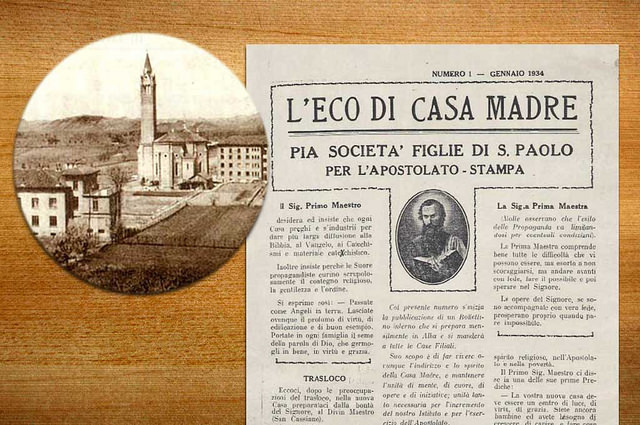 M. Thecla publishes in Eco di Casa Madre the program drawn up by the Founder concerning the foundation of the Sisters of Jesus the Good Shepherd. Accompanies the article with a few words of personal exhortation. Although in poor health, M. Thecla spends a period of time in Genzano (Rome) with the Pastorelle Sisters who are beginning their journey as an Institute. Writes a circular letter to the Daughters of St. Paul concerning the spirit of adaptation and universality that should characterize them. Writes to Fr. Alberione regarding her opinion of “three different apostolic sectors” (the press, liturgical and pastoral apostolates) in a single Congregation, informing him as to the concrete results of this situation when lived on a daily basis (J. Alberione, Lettere a Maestra Tecla Merlo [LMT], FSP Generalate, Rome, 1986, p. 79, Letter n. 53). Death of M. Thecla’s father, Ettore Merlo. Spends a period of time in reflection and prayer in Alba (LMT 60). On the Founder’s advice, convokes the Congregation’s superiors for a special course of spiritual exercises. Scope of the course: spiritual renewal. Asks the Sacred Congregation for Religious to grant the Institute of the Daughters of St. Paul pontifical approval and the Decretum Laudis. Heavy bombing over Grottaferrata (Rome), location of an FSP community. M. Thecla, who happened to be staying there at the moment, is miraculously saved, together with the sisters of the community. Welcomes into the FSP Generalate in Rome the Benedictine nuns who, because of the war, were forced to abandon their monastery of Santa Scholastica in Cassino. 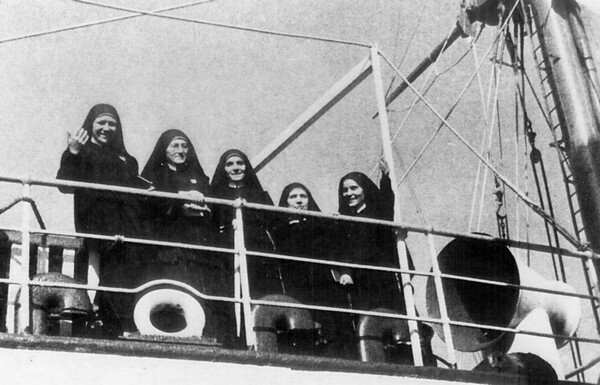 The nuns remained with the Daughters of St. Paul until 18 August 1944. 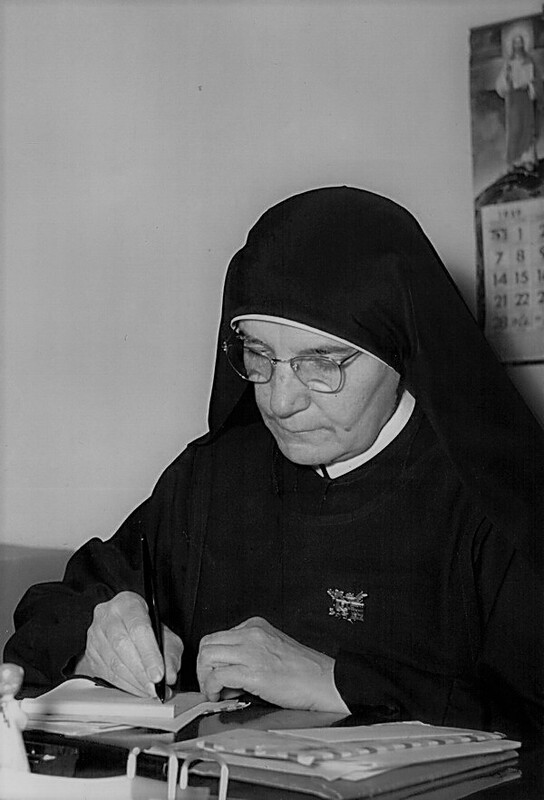 M. Thecla signs a petition asking the Holy See to recognize the Pious Disciples as an autonomous Institute. 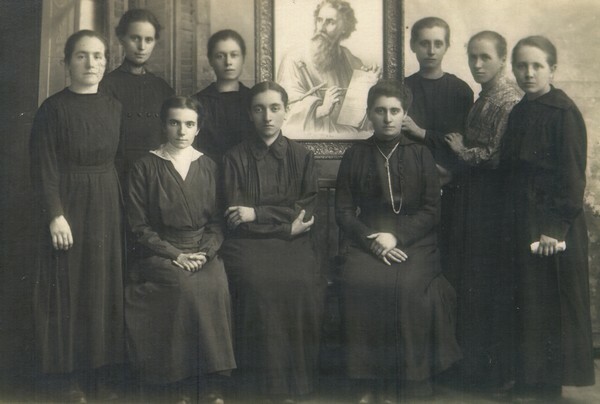 Writes to the Daughters of St. Paul: “The Lord’s care for us and our belongings [during the war] was linked to [the Founder’s] promise to build a church in honor of the Queen of Apostles in Rome.” Urges everyone to collaborate with the building’s construction. Is forced to decrease her workload due to bad health. Leaves from Naples with the Founder on the ship “Andrea Gritti” for a visit to the communities of the USA. From there goes on to Argentina and Brazil. On the return trip, again by ship, stops over once again in the United States. Returns to Rome on 23 May 1946. Death of M. Thecla’s mother, Vincenza Rolando Merlo. On the same day, the Daughters of St. Paul begin the cinema apostolate in collaboration with the Society of St. Paul. Bishop Luigi Grassi approves the Pious Disciples of the Divine Master as a Congregation of Diocesan Right. Opens a health-care community (clinic) for the Daughters of St. Paul at Albano, Italy. Writes an important circular letter on poverty, the foundation of the Pauline religious life. Leaves with the Founder for a round-the-world visit to the Pauline communities of India, Philippines, Japan, Mexico and the United States. Returns to Rome on 24 July 1949. Visits the communities of France and Spain. Returns to Rome on 11 October. Filming of Mater Dei. M. Thecla portrays the prophetess Anna. Other Daughters of St. Paul have walk-on roles, while some serve as costume designers, etc. Writes a circular letter inviting the sisters to grow in the spirit of the Institute, citing simplicity and quickness as elements of this spirit. Petitions the Holy See for pontifical approval of the Institute of the Daughters of St. Paul and definitive approval of its Constitutions. Supports a project to produce short catechetical films and helps concretize it by paying two-thirds of the expenses involved. Leaves with the Founder for a visit to the communities of North and South America: United States, Canada, Mexico, Chile, Argentina and Brazil. In Latin America, promotes the film apostolate in particular. Returns to Rome on 14 June 1952. Visits the communities of France. Returns to Rome on 26 July. Papal Secretary of State Bishop Giovanni Battista Montini writes to Fr. Alberione thanking him for the scripts of the short catechetical films. 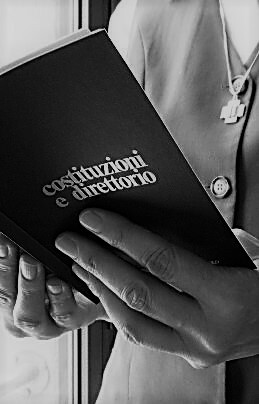 The Holy See promulgates the Decree of Pontifical Approval of the Congregation of the Daughters of St. Paul and also approves its Constitutions. Writing to tell the sisters about this, M. Thecla expresses her heartfelt gratitude to the Lord. Leaves with the Founder for a visit to the communities of Japan, Philippines and India. Primo Maestro falls ill in Bombay, India. M. Thecla welcomes him into the FSP community there in order to see that he receives proper care and then arranges for him to return quickly to Rome. She herself returns to Rome on 22 May 1953. Leaves with the Founder for a visit to the communities of North and South America: Canada, United States, Colombia, Chile, Argentina and Brazil. Returns to Rome on 3 Sept. 1953. Second National Council of Mothers General held in Rome. M. Thecla is elected president of FIRAS (Federazione Italiana Religiose Assistenza Sociale). Visits the communities of France, Spain and Portugal. Returns to Rome on 18 November 1953. Returns to France for a brief visit. Consecration of the Sanctuary of Mary, Queen of Apostles (now a minor basilica) in Rome. With the Founder, visits the communities of the Philippines, Japan, Australia and India. Returns to Rome on 2 June 1955. Travels to Sydney, Australia, with the sisters assigned to open a community there. Visits the communities of Great Britain, France, Spain and Portugal. Returns to Rome on 22 August 1955. With the Founder, visits the communities of North and South America: United States, Canada, Mexico, Colombia, Chile, Argentina and Brazil. Returns to Rome on 12 December 1955. Writes from the United States urging everyone to pray for Così, a magazine for young women whose first issue was programmed for December 1955. Visits the communities of Great Britain and Spain. Returns to Rome on 31 July 1956. 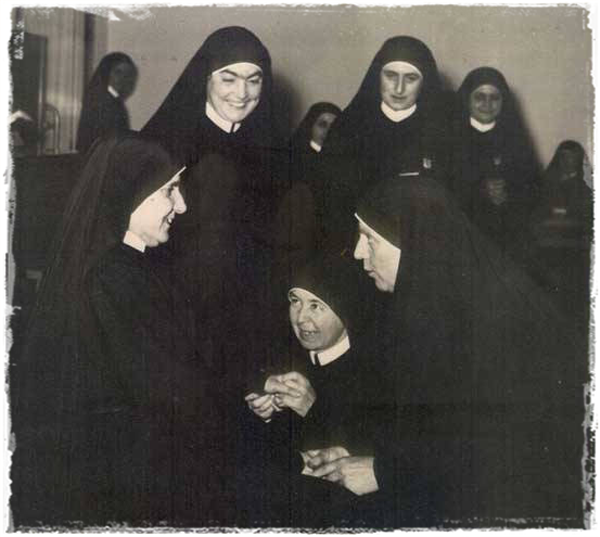 Convokes the first General Chapter of the Daughters of St. Paul, to be celebrated from 4-7 May 1957, following a course of spiritual exercises. Undergoes major surgery (a mastectomy) at Regina Apostolorum Clinic, Albano. Surgeon: Dr. Francesco Ojetti. Re-elected Superior General for another 12-year term by the Institute’s first General Chapter. 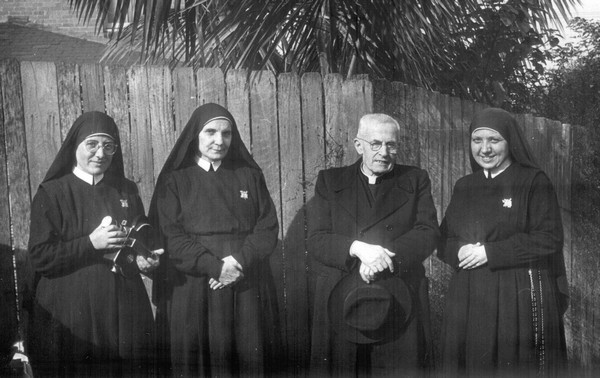 Encourages the sisters to develop the film apostolate, even though the fact of sisters working in this apostolate is not understood by many people. Fr. 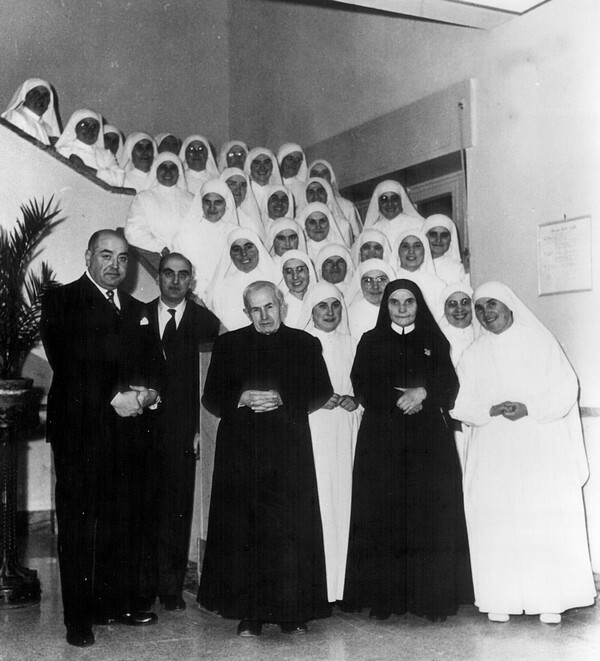 Alberione founds the first community of Apostoline Sisters at Albano, Italy. Together with M. Lucia Ricci, Superior General of the Pious Disciples, M. Thecla visits the communities of North and South America: United States, Canada, Mexico, Venezuela, Colombia, Chile, Argentina and Brazil. On the return trip to Europe, stops in Portugal. Arrives in Rome on 13 February 1960. On a visit to Brazil, encourages the sisters to begin the record apostolate. Visits the community of London, Great Britain. Visits the community of Madrid, Spain. Returns to Rome on 1 October 1960. Participates in a 20-day course of spiritual exercises held for FSPs of the “first hour” and for those involved in government and formation. Course held at Ariccia, Italy, from 15 May to 5 June. Animators: Fr. Alberione and Fr. Luigi Rolfo, SSP. During the 20-day course of spiritual exercises at Ariccia, on the Feast of the Holy Trinity, M. Thecla offers her life to God in order that all the Daughters of St. Paul might become saints. Visits the community of Leopoldville, Congo. Returns to Rome on 9 November 1961. Writes several pages of “memoirs” about Fr. Alberione. Makes her last trip to the Orient: India, Philippines, Formosa (now Taiwan), Japan, Korea and Australia. Returns to Rome on 19 May 1962. Falls ill in Pasay City, Philippines. M. Costantina Bignante is sent from Rome to take care of her and accompany her for the rest of her trip. Visits the communities of the United States and Canada. Returns to Rome on 3 September. Pope John XXIII opens the Second Vatican Council. Makes her last trip abroad, visiting the communities of the Congo. Returns to Rome extremely tired on 17 May 1963, but in spite of this continues to carry out her various duties. Suffers a brain seizure and is hospitalized at Albano. Receives a visit from her three brothers: Giovanni Battista, Carlo, and Fr. 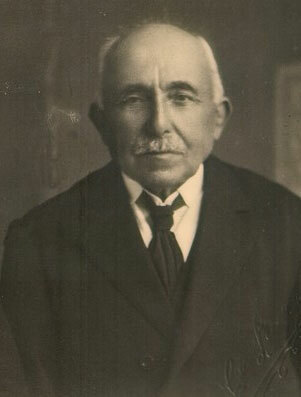 Leone Costanzo. Her health slightly improved, M. Thecla returns to Rome for a brief visit. Calls together all the sisters in the Via Antonino Pio community in order to greet them and thank them for their prayers for her recovery. All are deeply moved by her serenity and surrender to God. 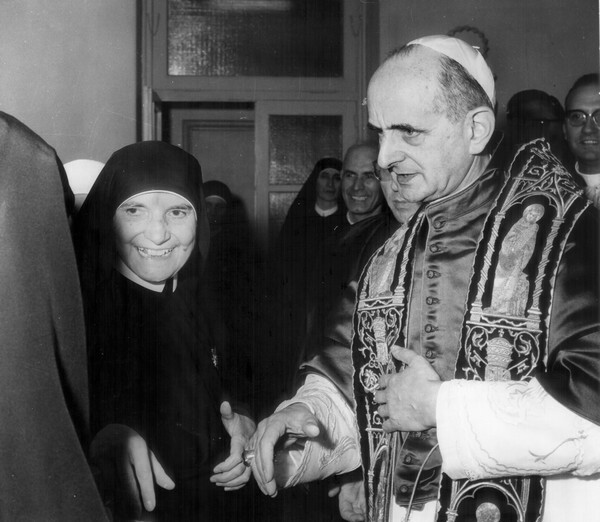 Joyful meeting with Pope Paul VI on his visit to Regina Apostolorum Clinic, Albano. On her feast day, returns to Rome for what will be her last visit to the community. Makes a brief visit to Grottaferrata (Rome) in order to see the local superiors of Italy, who are participating in a meeting there. Suffers a new and more serious attack of her illness. 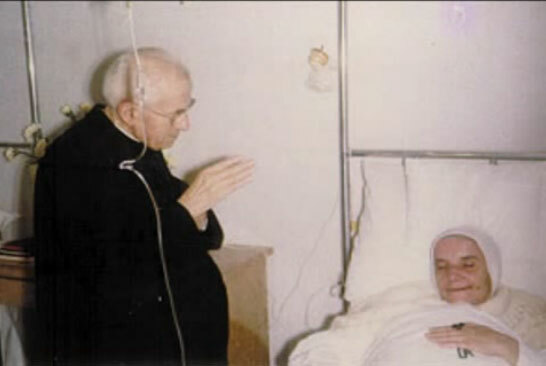 Receives the Sacrament of the Anointing of the Sick from Fr. Alberione. Spiritually assisted by Fr. Alberione, dies in Regina Apostolorum Clinic following a brain hemorrhage. Her funeral Mass, celebrated by Fr. Alberione, is held in the Clinic’s chapel. Her body is then taken to the Queen of Apostles Temple in Rome so that all the sisters and the members of the Pauline Family can pay their respects. Solemn funeral Mass in the Queen of Apostles Temple celebrated by Cardinal Arcadio Larraona, Prefect of the Sacred Congregation of Rites, who delivers the homily. M. Thecla is buried in the Verano Cemetery, Rome. M. Thecla’s remains are exhumed from Verano Cemetery and re-entombed in the subcrypt of the Queen of Apostles Temple, Rome. Feb. 6: solemn services in the Queen of Apostles Temple. That afternoon: solemn funeral Mass in the crypt attended by representatives of the entire Pauline Family. Feb. 7: M. Thecla’s mortal remains are entombed in the subcrypt. Cardinal Arcadio Larraona, Prefect of the Sacred Congregation of Rites, is formally petitioned to open the information-gathering process concerning Maestra Thecla Merlo. The Sacred Congregation of Rites publishes a decree opening the ordinary information-gathering process. 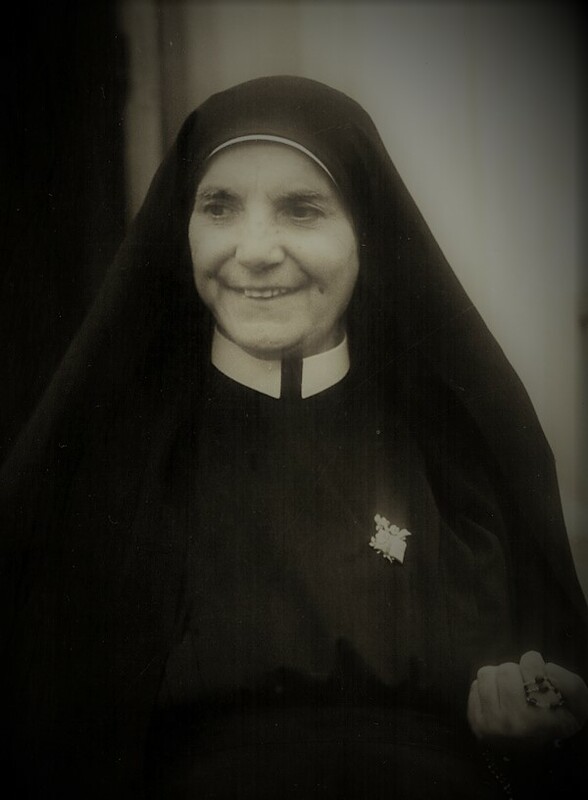 The Vicariate of Rome initiates the Ordinary Process of gathering testimonies and documentation concerning M. Thecla’s life, virtues, reputation for holiness and the miracles obtained through her intercession. The process closes on 23 March 1972. The Tribunal of Alba opens the Rogatorial Process, which closes on 4 May 1971. 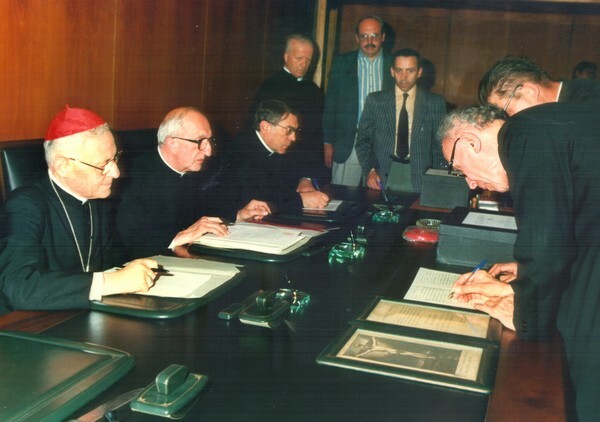 The Vicariate of Rome opens the Apostolic Process, which closes on 17 June 1987. The opening and closing of the Process take place in the headquarters of the Tribunal in Rome.